Vail community host Ann Antonius, center left, poses for a photo with the Hulme family, in town from Philadelphia, on Christmas Day in Lionshead Village. Antonius presented the family with a Christmas gift of a free parking voucher as part of the town's Random Acts of Kindness community outreach program. VAIL — Clear skies have returned to the valley, creating classic Colorado conditions on the mountains — soft snow and plenty of sunshine. And for a storm that wasn’t expected to leave much snow, the 27 inches of new fluff Vail Mountain measured during the past week was a welcome surprise to visitors to the valley. As of Christmas Day, Vail had received 107 inches of snow so far this season, about a third of the resort’s average in the first month of operation this season. The mid-mountain base is holding steady at 38 inches, the best holiday season base we’ve seen in several years. 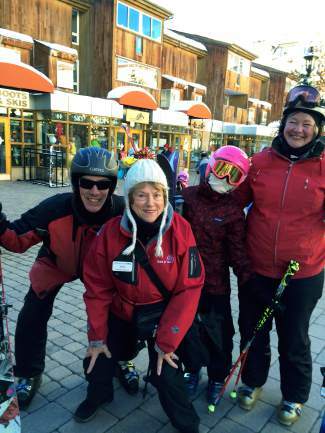 For Debbie Powell, of Fort Worth, Texas, it was her third trip to Vail in the past 12 months. She said the conditions have gotten better each time she’s visited. Powell, a skier, was spending time with her daughter, 17-year-old Jordan, a snowboarder. She said in addition to spending time in Vail and Beaver Creek, they’re going to head to Boulder. For those less familiar with the area, the abundant snow was a welcome challenge. Mark Newman was enjoying his first trip to the Rocky Mountains during the Christmas holiday. The Washington, D.C., resident snowboarded at Vail and Copper Mountain while he was in town. Janis Vanags, of Latvia, was drawn to town by more than just the snow. Vanags said he was traveling from state to state across the mountains of the U.S. and had been to Mt. Bachelor in Oregon, Sun Valley in Idaho, Park City in Utah and Aspen, Beaver Creek and Vail in Colorado. He said the snow in Colorado was the best of the places he visited. At the Vail Welcome Center, workers said guests have been pouring in from out of town, looking for ways to enjoy the snow. On Wednesday, the Hulme family from Philadelphia received a Christmas present from community host Ann Antonius as part of the town’s Random Acts of Kindness outreach program. “She gave us a voucher for free parking for the day,” Steve Hulme said. All the early season snowfall has had backcountry skiers active, as well. But the Colorado Avalanche Information Center was reporting that avalanche danger in backcountry areas near Vail was considerable on Thursday, with several slides reported on Wednesday. The Avalanche Information Center said human-triggered slides remain possible to probable for our area on Thursday.